Cabernet House, 4 bedrooms, 2 baths, dog friendly vacation home centrally located. Spacious but cozy 4 bedroom 2 bathroom home. The main floor bedroom has a queen bed with enrsuite and a walk out to the back yard. Upstairs is 3 bedrooms – 2 queens and a set of twins. Bathroom has standard tub/shower combination for your convenience. We even supply the soap, shampoo and hair dryers. A fully equipped kitchen has open access to the family room. The fully stocked laundry room is off the kitchen for your convenience. Our vacation home has a fenced in yard with patio furniture, bbq/grill - a perfect gathering place for your coffee or recently purchased wine at one of Niagara's Finest Wineries. Professionally cleaned, we provide bed linens and towels. Parking for 4 small cars, but bigger vehicles, and the max is 2! Cabernet House is an amazing, centrally located vacation home. Close to the finest restaurants this town has to offer, but also an easy walk to family style restaurants, coffee shops and the biggest park in town, The Commons (Public swimming, tennis courts, walking and biking trails, and an interactive museum about the history of the Commons). Boutique shops, grocery and Shaw Theatres are an easy 10 minute stroll along pretty streets. The community pool is a 10 minute walk away and is open from mid June to Labour Day weekend. There is a daily fee for the community pool! We accept visa or master card and all payments to Niagara Holiday Rentals are in Canadian $. High season is between May and October, low season is Nov to April (except the holiday season). In Canadian our rates range from $350 to $450 Canadian, plus applicable taxes and fees. Call Janet today to get your vacation booked in Canada's Prettiest Town. We are a young family who lives in Ancaster and loves coming to Niagara-on-the-lake. We love coming all times of the year as it is so beautiful at Cabernet House in any weather. Our children love coming and running around the backyard. While we sit on the deck and bbq/grill us something to eat. We love walking to the park or just walking down Queen Street looking in the store windows. We purchase this property as we love Niagara-on-the-lake. We love coming to Cabernet House and just relaxing or in some case I come here to study. No matter what the reason we love coming here and reconnecting as a family. 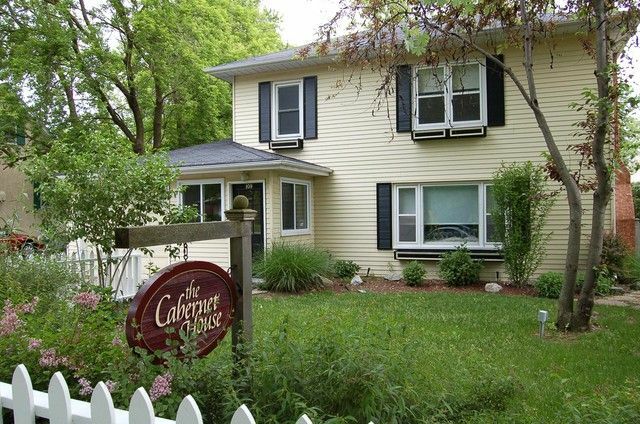 We love Cabernet House as it is perfect for our young family to grow up in and have lasting memories of Cabernet House in Niagara-on-the-lake. We supply all towels, some shampoo, body wash and toilet paper. If you need your Tim Horton's in the morning. Your in luck as Tim Horton's is a 5 minute walk from Cabernet House. Plus you can stop at the bakery and get some delicious bake goods to snack on or dessert on your walk back from Tim Horton's. We stayed recently for the weekend to celebrate our anniversary. It was our first time using VRBO and we highly recommend it! The house was exactly as it appears in the pictures, very clean. Nicely fenced in which was great because we brought our dogs with us. Its in a great location close to downtown and very close to a huge beautiful park to bring your dog. Janet was absolutely wonderful very helpful and easy to get in touch with. The house was exactly like the photo's. Plenty of space for the 6 of us. Beds are very comfortable. Good location! Great location, good space for a reunion of 8 good friends. Janet was very responsive in communicating. (Thank You!). Cabernet House was well-located. We were able to walk to the downtown area in minutes. The historic section is a pleasant walk at any time of year. We were comfortable in our 4-bedroom, 2 bath home. A perfect location for our reunion of friends. My family of 6 had a wonderful time staying in Niagara on the Lake. The town is absolutely beautiful and there is so much to do! The Cabernet House was conveniently situated and suited our needs perfectly. Getaway weekend for 7 Moms and teens - Cabernet House was the perfect House! Clean, lots of space and a lovely backyard! Lovely house. Excellent space and family friendly. Great location. Perfect spot for our weekend holiday to Niagara!!! HST tax (13%) will be added to all bookings.